Resolution: With a score of 41lp/mm, sharpness is just average. Resolution is optimal at f/5.6. Vignetting: Strong at f/2.8, with a loss of up to -1.4 EV. It stabilizes at f/4, with a loss of only 1/3 EV in the corners. Chromatic aberrations: Important at f/2.8, but diminishing progressively as one closes the aperture. Resolution: With a score of 39lp/mm, sharpness is just average. Resolution is optimal at 10mm f/4. Distortion: Visible at 10mm (similar to the Nikon 1 NIKKOR 10mm f/2.8), and weak for other focal lengths. Vignetting: Reasonable for this kind of short focal length, with a maximum loss of up to –0.6 EV. There is no loss starting at f/5.6 for 10mm, 14mm, and 24mm focal lengths. To overcome the phenomenon at 30mm, one must shoot starting at f/8. Chromatic aberrations: Very good, diminishing as the focal length increases. Resolution: With a score of 39lp/mm, sharpness is just average. Resolution is optimal at f/5.6, but only in the image center. Vignetting: Globally “very correct,” with a maximum loss of up to –0.9 EV, and negligible or nonexistent for all focal lengths starting at f/5.6. It is worth noting that there is no vignetting until 2/3. Chromatic aberrations: Very good, no noticeable problems. The Nikon 1 NIKKOR 10mm f/2.8 is very light (77g) and very compact, thus transportable… but not very versatile. The Nikon 1 10-30mm and the Nikon 1 30-110mm are also quite light (115g and 180g, respectively). The two lenses together cover a wide range (the equivalent of 27–297mm), making them useful in most situations that amateur photographers will encounter. The new Nikon 1 lens line also includes a so-called “video” lens, the NIKKOR VR 10-100mm f/4.5-5.6 PD-ZOOM. This new lens can be mounted on both the Nikon 1 J1 and Nikon 1 V1. The most unusual (and best!) thing about this zoom lens is that there isn’t a manual focusing ring. Instead, it uses a “T-W” drive on the lens itself to change focal lengths, which helps the user zoom in and out smoothly. In addition, the rate of zoom change is more or less proportionate to the amount of pressure on the drive — very fun for shooting video. DxOMark Score: A weak 6, understandable in light of the low-light performance of the Nikon 1 J1 and V1 sensors. This DxOMark score, particularly its low-light component, demonstrates once again the limits of the Nikon 1 cameras. Resolution: At 40 lp/mm, this lens has good sharpness for this type of equipment, with higher resolution at 30mm than at other focal lengths. The 10mm focal length becomes interesting at f/4.5-5.6. Distortion: Visible at all focal lengths, it is at its weakest at 30 mm. Vignetting: Darkening is especially present in the last third of the field, where one can lose up to -0.9EV. This said, one good point is that there is no measurable loss of light on 2/3rds of the field. Chromatic aberrations: Important in the corners at 10mm and 100mm; once again, 30mm seems to be the optimal focal length. Nothing surprising about the results for particular lens and lens type, which shows reasonable quality at 10mm and 30mm. However, at 530g, this is a fairly heavy lens. We expected something lighter, particularly for a camera that one might want to carry in one’s pocket. In practical terms, the Nikon 1 NIKKOR VR 10-100mm f/4.5-5.6 PD-ZOOM has been well thought-out for shooting video. As a lens for shooting still images, it’s not very interesting, given that it is heavier than both the Nikon 1 NIKKOR VR 10-30mm f/3.5-5.6 and the Nikon 1 NIKKOR VR 30-110mm f/3.8-5.6 put together, and especially since its image quality is only equivalent to these lenses, not better. Let’s compare how these new Nikon lenses perform on Nikon 1 cameras against the performance of similar lenses on other cameras. Our goal, by the way, is not at all to denigrate the Nikon 1 cameras in comparing their lens quality results to those of the Nikon D3X and other cameras, since this would be entirely unfair (given that the different kinds of cameras are not comparable). Rather, we are using these measurements to show the relative strengths and weaknesses of these new lenses. Resolution: 41 lp/mm for the 10mm and 52 lp/mm for the 35mm — only 11 lp/mm difference, which is not very big when one considers the enormous difference in quality between the two Nikon sensors. Thus the resolution of the 10mm is quite excellent. Chromatic aberrations: 15µm for the 10mm and 14µm for the 35mm, meaning that both lenses are similar in this regard. First observation: The 10-30mm achieves the same DxOMark score of 7 as the lenses in its competitors’ kits, but with a smaller sensor, so it is a serious rival. Resolution: At 39lp/mm, the results for the 10-30mm on the Nikon 1 are as good as for the 18-55mm (44lp/mm) and the 14-42mm (34lp/mm). A solid performance. Chromatic aberrations: Better corrected on the 10-30mm (7µm) than on the 18-55mm (10µm) and the 14-42mm (8µm). The differences are visible on the maps. Resolution: At 38lp/mm, the results for 30-110mm closely follow those for the two Nikon super-zooms (45lp/mm for the 70-200mm and 42lp/mm for the 70-300mm), thus excellent by comparison. Chromatic aberrations: Better corrected on the 30-110mm (6µm) than on the 70-300mm (16µm), and equivalent to the 70-200mm (5µm). The Nikon 1 10mm is an excellent substitute for a 27mm lens. 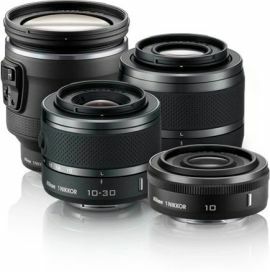 The Nikon 110-30mm is comparable to the lenses found in Nikon and Olympus kits. The Nikon 130-110mm holds up well against Nikkor 70-200 and 70-300 lenses. In the course of testing, we perceived that the quality of the JPEGs that the cameras produced was far less than excellent. This is a shame, considering the potential for the same kind of excellence as seen with RAW images.